Since its emergence as an organized state, Russia has collided with the West. For over a millennium, the two have clashed economically, politically and militarily, using the countries that form the buffer between them as a staging ground for their rivalry. With Ukraine’s Euromaidan uprising and Russia’s subsequent annexation of Crimea in March 2014, the long-standing conflict has been renewed. But just as the end of the Cold War did not resolve hostilities between Russia and the West, neither will a resolution to the Ukrainian crisis erase the fundamental imperatives that have pitted the two against each other for more than a thousand years. The Russia-West divide began when the kingdom of Kievan Rus, the Slavic precursor to the modern Russian state, arose in Eastern Europe in the ninth century. With territory stretching from the Baltic Sea to the Black Sea, Kievan Rus was one of medieval Europe’s largest states. Toward the end of the 10th century, the kingdom adopted Orthodox Christianity as its official religion, opening a rift between itself and its Catholic neighbors in Western Europe and laying the groundwork for future contention between East and West. A few centuries later, the Mongols invaded and destroyed Kievan Rus, and the state’s center of power shifted from Kiev to Moscow. The city became the heart of the Grand Duchy of Muscovy, a rising Orthodox and Slavic power that amassed its strength and territory during the 14th and 15th centuries. Meanwhile, Kiev (and much of modern-day Ukraine) became part of Catholic Poland and Lithuania, forging a lasting bond with the West. The Grand Duchy of Muscovy continued to expand and transform, first into the Tsardom of Russia in the 16th century and then into the Russian Empire by the early 18th century. Few geographic barriers stood between it and mainland Europe except vast and empty plains. And so, the empire extended its borders westward, vying with Poland, Sweden and Austria for territory in Eastern and Central Europe. By the start of the 19th century, Russia had become as powerful as many of Europe’s strongest states. But the lack of geographic barriers surrounding it also made the Russian Empire vulnerable. It needed to create space between itself and other formidable powers, and it did so by spreading its influence in the territories on its periphery. The empire gradually and systematically took control of Siberia, the Caucasus and Central Asia. This brought the Russians into both contact and conflict with Muslim and Asiatic powers such as the Ottomans and Persians, as well as the European powers that held substantial sway in those territories, giving rise to great-power rivalries like the Great Game. As Russia evolved, so did its rivalry with Europe. Then, at the start of the 20th century, something changed. The United States emerged on the international stage as a new global power, and the dynamics of the Russia-Europe conflict shifted. For the first time, a power that was not of the region played a significant role in its politics, first in World War I and then again in World War II. The competition between Russia and the West became an international one whose significance extended well beyond its geographic borders. By the end of World War II, Russia’s influence on the Continent had spread farther than ever, reaching as far west as Berlin. In response, the West formed a new strategy to halt the Soviet Union’s spread: containment. Spearheaded by the United States, the strategy applied not only to Russia’s presence in Europe but also to its activities around the globe. The competition took on global proportions during the Cold War, with its participants divided into two diametrically opposed political and military blocs: the Warsaw Pact and NATO. Although the collapse of the Soviet Union in the early 1990s marked the end of the Cold War, it did not signal an end to the broader dispute between Russia and the West. At first, though, all evidence seemed to point to the contrary: Talk arose of incorporating Russia into Europe and the Western alliance, and it even appeared to be feasible. Moscow had lost its Eurasian empire, and the new Russian Federation had embraced democracy and capitalism, at least initially. But the transition proved so chaotic and painful for Russia that, within a decade, the state began to recentralize power as Boris Yeltsin left the presidency and Vladimir Putin assumed it. The 1990s, celebrated by the United States and Western Europe as a golden age of Russian economic growth and democracy, were lamented by Russian leaders and much of the public as a catastrophe. In its weakened state, Russia no longer needed to be actively and overtly contained by the West, and tensions between the two tapered off temporarily. However, the geopolitical imperative underpinning the United States’ containment policy — blocking the rise of regional hegemons on the Eurasian landmass that could challenge the Western alliance structure — never disappeared. Thus, NATO and the European Union continued to expand. Meanwhile, Russia recovered and Putin consolidated his power. The Kremlin worked to regain its position in the former Soviet periphery. On a rising tide of high energy prices and political stability, Russia began to re-emerge as a regional power. Russia’s resurgence reignited the conflict between it and the West. The two fought for the allegiance of states in the former Soviet periphery, most clearly in the 2008 Russo-Georgian War, when Russia invaded Georgia after it and Ukraine attempted to join the Western alliance structure, particularly NATO. The European Union responded by launching the Eastern Partnership program in 2009, with the goal of strengthening economic and political ties with former Soviet states. In 2010, Russia countered with its own integration program, the Customs Union. The rival blocs sought to attract countries in the Eurasian borderlands, perhaps the most contested of which was Ukraine. When, in November 2013, Kiev refused to sign an EU association agreement, the cornerstone of the Eastern Partnership program, protests erupted that ultimately transformed into the Euromaidan revolution of 2014. The situation quickly deteriorated, as Russia annexed Crimea and lent its support to the pro-Russia rebellion in Ukraine’s east. Since then, hostilities between Russia and the West have intensified, reaching levels not seen since the Cold War. With a proxy conflict in Ukraine, Western sanctions and Russian countersanctions, and military buildups on both sides, it is clear that the Russia-West confrontation has once again come to a head. Less clear is the shape that the Russia-West confrontation will take in the coming years. The geopolitical imperatives that form the conflict’s foundations will remain intact, as will the cultural differences that have spurred their competition in the Eurasian borderlands. But many changes are on the horizon as well, some of which could shift the balance of power in the West’s favor. One such change is the massive demographic shift that is underway in Russia, Europe and the former Soviet periphery. By 2050, U.N. demographic projections expect Russia’s population to decline from 143 million to 129 million, a loss of nearly 10 percent. The West, by comparison, has a more favorable outlook: The United States’ population will grow by over 20 percent, from 322 million to 389 million, while Europe’s largest countries will end up somewhere in between Russia and the United States over the same period. Germany’s population will shrink by 7 percent, from 81 million to 75 million; France’s population will grow by 11 percent, from 64 million to 71 million; and the United Kingdom’s population will rise by 15 percent, from 65 million to 75 million. Each of these trends will shape the economic and military standing of their respective countries over the next 25 years. Consequently, Russia’s ability to challenge the West by projecting its economic and military power will likely decline in the coming decades. Of course, demographic growth does not directly equate to the projection of power, and the West (particularly Europe) will experience challenges stemming from immigration and high non-European birth rates. Still, Russia’s relatively steep demographic plunge can be expected to undermine its ability to influence its former Soviet neighbors. This will only become truer with each year that passes since the Soviet Union’s collapse, as the social and cultural bonds that tie Russia to its periphery continue to weaken. This is not to say Russia’s influence in the Eurasian borderlands will evaporate completely. Russia has been the dominant foreign power in the region for centuries, and its position has withstood serious challenges and periods of dramatic upheaval. Thus, Moscow’s primary challenge in the next 25 years will be to figure out how to maintain its advantage in the former Soviet periphery as its resources decline and the cultural and political ties underpinning its position erode. The West will likely face its own challenges in the years ahead. A shift toward greater regionalization is already underway in Europe, and it will likely intensify in the next 25 years as groupings of states with shared political and cultural characteristics overtake the Cold War-era institutions of the European Union and, to a lesser extent, NATO. This does not mean the two will collapse entirely. Instead, they will likely be reshaped into more practical and sustainable forms. Nor will it necessarily lead to a power vacuum in Europe that Russia could exploit. In fact, it may allow some European countries to better deter Russian aggression. Nevertheless, the format and manner in which the West can challenge Moscow will almost certainly change. These are the broad strokes that together start to shape the Eurasian borderlands’ future. Though other factors, including technological developments and the emergence of new political ideologies, will no doubt shape the Russia-West confrontation as well, by nature they are more difficult to predict. In this series, Stratfor will explore how the rivalry between Russia and the West has played out in Ukraine, Eastern Europe, the Caucasus and Central Asia prior to and since the collapse of the Soviet Union. We will then forecast how it is likely to change in each region over the next 25 years — a period that is poised to be just as dynamic, as both sides prepare for the sweeping changes ahead. Russian expansion in Syria is taking place quickly. 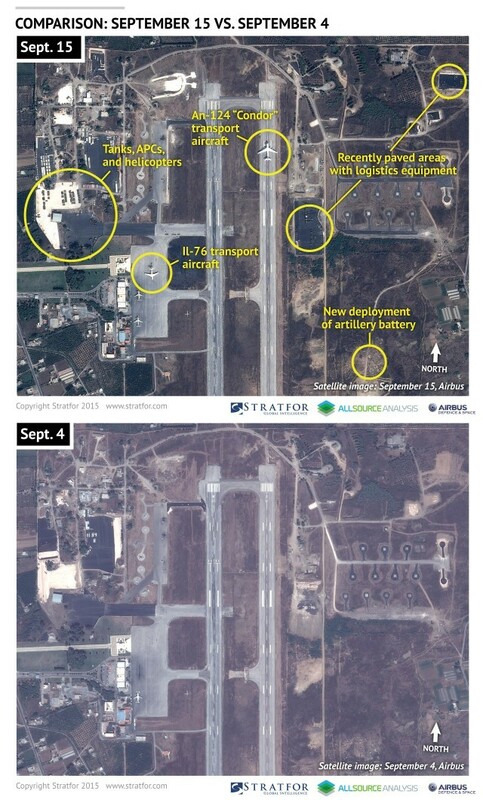 Satellite images taken by Stratfor and published by Reuters show a build up of tanks, helicopters and other heavy weapons. 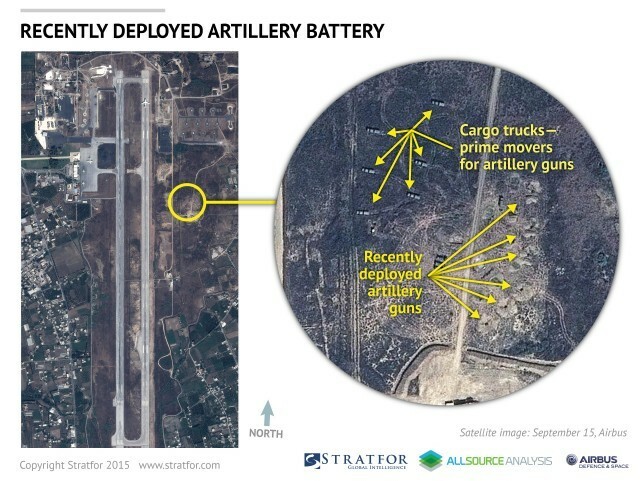 It is estimated now that there is already 500 troops on the revamped air base. Sources including Debkafile show that Russian troops are also actively fighting in Syria. The increasing Russian military presence in Syria is not considered to be an invasion but once Russian casualties begin to mount its hard not to imagine Putin getting sucked into the vortex of the Middle East. 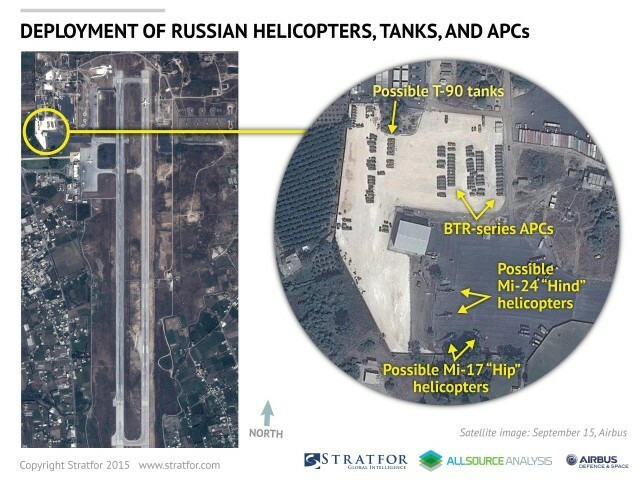 What is particularly obvious is that Russia is setting up infrastructure for quick access into the middle east through the development of a Syrian airbase. 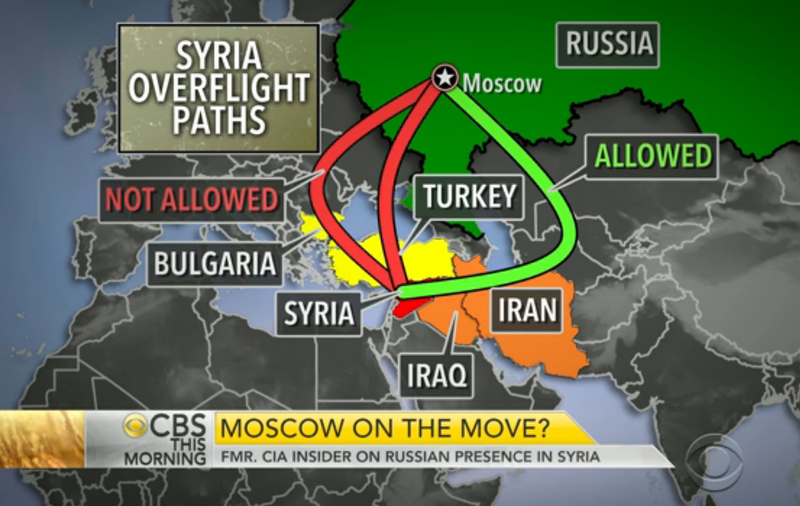 However while the airbase is expanding its troop numbers via cargo flights, Russia is not allowed to fly through Turkey or Greece and therefore must take a very uneconomical route through Iran & Iraq. Interesting to note that Turkey is a logistical thorn in Putins side at the moment as Russia continues to expand in Syria. Pro US Turkey and Greece won’t allow Russia to use their airspace – wonder how long this will last for. Source: Business Insider. Furthermore all Russian naval cargo is coming through the Bosphorus which is a channel controlled by Turkey. It was recently reported that Turkey threatened to blockade the Bosporus to Russian ships. Imagine if they tried to do that anytime soon!